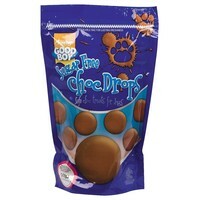 Good Boy Sugar Free Choc Drops Dog Treats are delicious chocolate treats, ideal for dogs which may be prone to weight gain, have dental problems or hyperactive dogs affected by sugar. These yummy treats are made from the chocolate substitute Carob, completely safe for your dog's digestive system. Perfect for use as rewards for good behaviour or simply just to spoil man's best friend!